Last year I made a quilt named "Safe Harbor" and donated it to Bello Machre, a private non-profit residential home for mentally and physically handicapped children and adults in Baltimore, MD. The quilt was raffled and all funds went to Bello Machre. I support this organization for my nephew, Neil, has been a resident of Bello since he was sixteen years old and my sister could no longer physically handle caring for him alone. 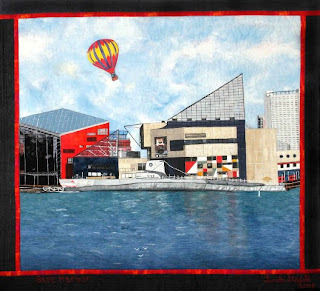 The quilt is based on a photo I took of the Inner Harbor in Baltimore and is called "Safe Harbor" for Bello has truly been a safe harbor for my sister and nephew. The hot air balloon I added is very symbolic for I put my nephew's name on the basket to represent how his development has soared since moving to Bello. One of my sister's close friends won the quilt last November. On Christmas Morning this year she arrived at my sisters home with the quilt and case gift wrapped and gave it to her to keep as a heirloom for her family! Needless to say there were numerous teary, emotional phone calls Christmas Morning. For the past few years, award-winning quilter Bonnie McCaffery (well known for her Painted Faces and DigiBobbE techniques) has been interviewing quilters and producing videos, which she posts on her website. 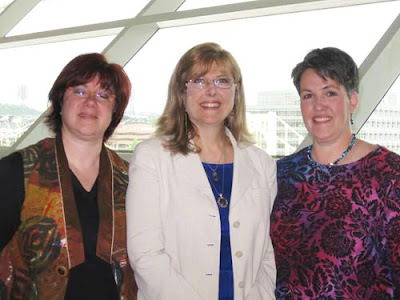 In May, she interviewed me and Janet at Spring Quilt Market in Pittsburgh. Bonnie’s just posted the VidCast, and you can now see it on her website! For a complete list of Bonnie’s VidCasts, click here. You’ll find interviews with some amazing quilters, including Charlotte Warr Andersen, Maggie Weiss, Paula Nadelstern, Robbie Joy Eklow, Terry White, Larkin Van Horn, Isabelle Baydova, Maggie Grey, Denise Tallon Harlan, Ellen Lindner, Sue Nickels, Linda Schmidt, Ferret, Jenny Bowker, Melinda Schwakofer, Ricky Tims, Esterita Austin, Alex Anderson, and Caryl Bryer Fallert. Bonnie is a fantastic teacher, a very talented quilter, and a really great person. It was an honor to be interviewed by her. Thanks, Bonnie! 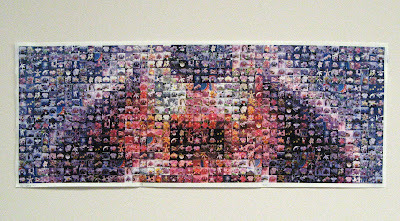 They're photomosaics...one is black and white, the other is color. And both are inspired by this lovely image posted by "geishaboy500/THOR" on Creative Commons. 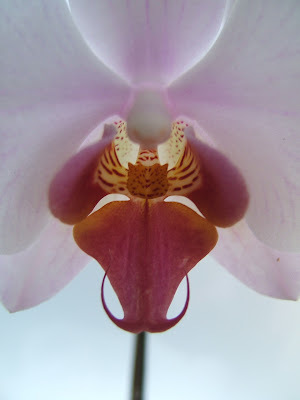 It's a terrific close-up showing the center of a typical orchid flower. The "landing platform" is an inviting perch for pollinating insects passing by. A pretty clever evolutionary adaptation. A little Photoshop magic helped me saturate the colors and emphasize the edges so that they'd be apparent in the finished mosaic. 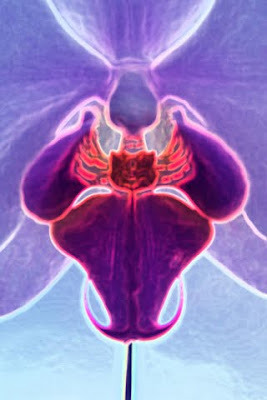 This is now the "target image," the image that viewers will see when they look at the piece from a distance. 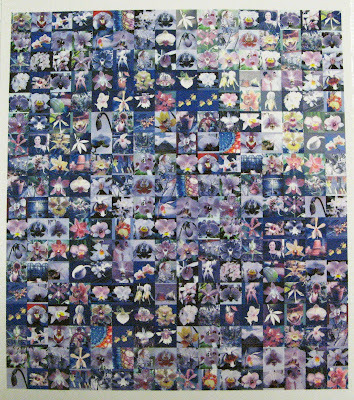 I've now subdivided the target image into 12 8"x9" rectangular sections and made each of those sections into a "mini-mosaic." 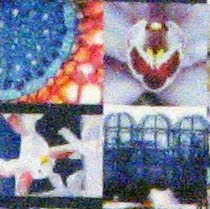 The tiles for the mosaic come from a collection of about 100 photos that I've collected of orchids and orchid-related images." Antoine Hinain's cross section of an orchid root as seen under the microscope.Steve Conry's orchid closeup; a greenhouse in Curitiba, Brazil by Marcus Guimaraes; and a Jewel orchid by JonBoy Mitchell. So now I'm at the point of putting the pieces together, row-by-row. Here's a row composed of 3 "mini-mosaics" pieced side by side. This is actually the second of the 4 rows that will eventually make up the piece. Eventually, if all goes well, the finished piece will look something like the image at the right. My friend Sarah Ann Smith has been writing a series on the elements and principles of design for machine quilters for Machine Quilting Unlimited magazine. The most recent installment is “Depth and Dimension through Contours, Rhythm and Repetition” in the January 2010 issue. 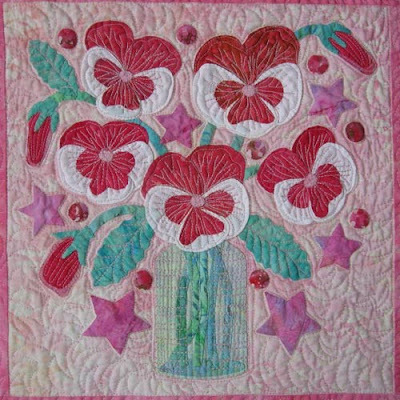 When Sarah was writing this column, she was looking for examples from both traditional quilts and art quilts, and asked if she could include my quilt, Pink Petal Party. How nice! Sarah notes that the dense quilting in the background helps to concentrate attention on the focal point, the vase of pansies. She also points out the realistic stitching on the pansies, and the stitching on the vase, where vertical lines cover the whole vase and horizontal lines come in from the left and right sides, making the center appear to come forward. The article features photos of beautiful work by Sarah and Suzanne Sanger to illustrate her wonderfully informative column. 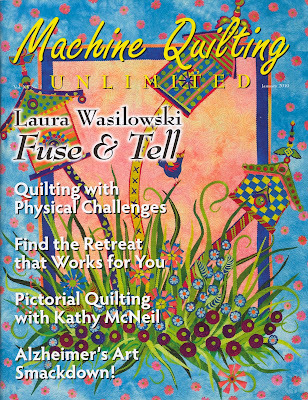 Machine Quilting Unlimited has a great mix of articles for long-arm machine quilters as well as for those of us who use regular home sewing machines. And there’s a nice balance of traditional quilting and art quilting. In the January issue, there’s a great profile of Laura Wasilowski, whose work is featured on the front cover.